I have prayed and considered for nearly three weeks whether to respond to the statement by Sovereign Grace Churches posted on February 13th. This blog post is the most extensive statement by the organization with respect to serious questions that have been outstanding for nearly a decade. 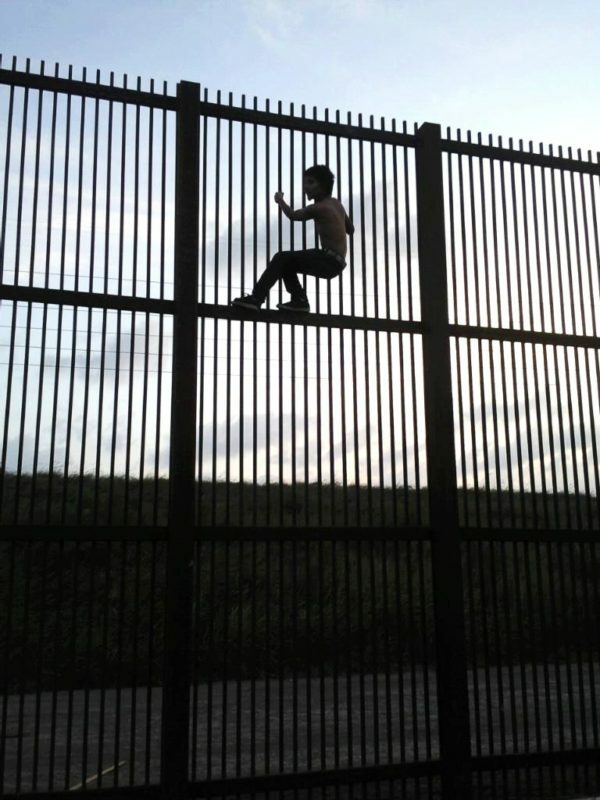 However, the response is misleading on several vital points, and leaves many disturbing questions unanswered. Because of this, I have chosen to respond in greater detail and renew my call for Sovereign Grace Churches (SGC, formerly Sovereign Grace Ministries (SGM)) to submit to an independent third-party review of how they have handled reports of abuse. of abuse, and the failure to report it, is likely worse than in the Roman Catholic Church – a religious organization often used by evangelicals as a byword for sexual assault scandals. Research bears out the claim these experts make. Because many churches are ideologically committed to the theories that lead them to handle abuse so poorly, many church leaders are very sincere, yet sincerely wrong. Sadly, these leaders and institutions also remain resistant to outside accountability or input. This is a serious problem that damages the gospel and pushes the most vulnerable away from hope and refuge. Addressing this issue is not damaging the Gospel, it is instead seeking to restore the Gospel and Christ to their rightful authority and priority over institutions and mishandled theology. She continues to call for an independent investigation of the charges against SGC. It is hard to see any problems with this request. If SGC doesn’t trust GRACE then another person or group could surely be secured to do the job. 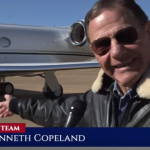 The televangelist in the title is Kenneth Copeland who, at the last minute before his controversial scheduled speech to troops at Fort Jackson, Columbia, SC, issued a new confusing statement about post-traumatic stress disorder. The full statement is provided at that article; I think the title of the news article is accurate. You’ll recall that Kenneth Copeland, along with self-styled historian David Barton, told soldiers suffering with PTSD to get rid of PTSD by reading Bible verses and rebuking Satan. That advice brought condemnations from a variety of Christian and other groups, including those who advocate for veterans. From our perspective, a Christian should ask the Lord what steps of recovery should be taken to receive natural help for the disorder. 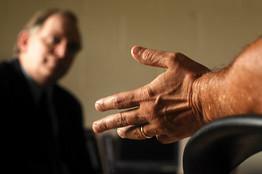 Many Christian organizations exist to give Bible-based help to those that suffer from PTSD. 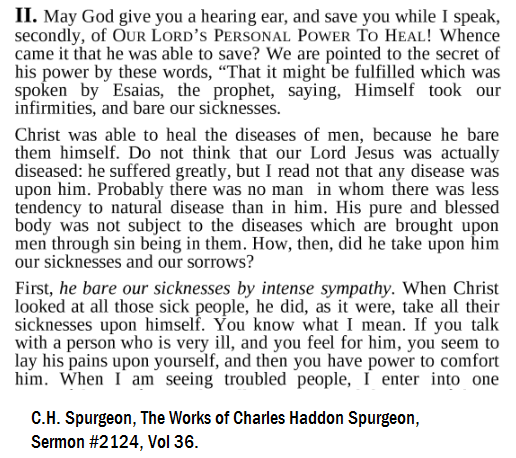 Our first priority as Christians should always be to find scriptures that offer hope for healing and deliverance from the maladies that we are confronted with. Prayer, application of God’s Word, and ministry from professionals will bring the lasting help that those suffering need. Brother Copeland would be the first to tell you the doctor is your best friend if you are sick and your healing has not yet fully shown up. It takes time for your faith to develop. For that reason, it is perfectly all right to pursue medical attention as well. In fact, to refuse to consult a doctor or perhaps stop taking medication (prescription or over-the-counter) before faith is fully developed for healing is potentially dangerous. That would be considered ‘presumptuous’ faith. Any of you suffering from PTSD right now, you listen to me. You get rid of that right now. You don’t take drugs to get rid of it. It doesn’t take psychology. That promise right there will get rid of it. God is not competing with doctors or medicine. Like any loving father, He will use any avenue available that you allow Him to work through to help you get well. Getting you well is His desire. Any good doctor will tell you he does not do the healing. He only assists your body to work the way it was created and designed to function by God. This new moderate sounding Copeland emerged the day before his scheduled visit to Fort Jackson. However, he doesn’t explain what changed in his beliefs, if anything. He doesn’t say he was wrong before nor does he express any regret for his previous bad advice. As far as I can determine, Copeland’s appearance went as scheduled today. The Gospel Coalition’s Joe Carter called this advice “gospel destroying” and “demonic.” Copeland still has aspects of this advice on his website (source and source). I did a short series on PTSD which highlighted damaging aspects of Copeland’s and Barton’s advice. In short, their advice was insulting to PTSD sufferers. The military should warn their people about Copeland, not invite him to lecture them. I hope the General decides to find another speaker. In my opinion, Copeland disqualified himself to speak to our service men and women. In addition to his bogus advice about PTSD, he teaches that people who recite certain Bible verses will survive war. In essence, his teaching is that Christians will survive if they do the right things and recite the right magic Bible verses (Psalm 91 is one he suggests). In his PTSD video, he claims that the Bible gives a promise of survival to soldiers who fight for God. I don’t know what happens to people who don’t believe these things according to Copeland. I can’t imagine what he will say that will be of general benefit or encouragement to people of all faiths. His teaching in his Veteran’s Day video and on his website requires a rather close adherence to his specific interpretation of the Bible. There are many Christians who reject this approach, not to mention those of other faiths and no faith. Surely, General Johnson can find someone who can bring people together and respect troops of all faith traditions. National Prayer Breakfast to take place Feb. 1 at NCO Club sponsoring the National Prayer Breakfast for the Fort Jackson Community 7:30-9 a.m. Feb. 1 at the NCO Club. 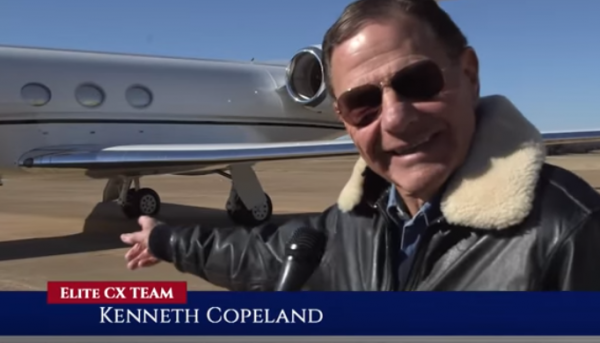 Nationally recognized televangelist Kenneth Copeland will be the speaker. Tickets are available from your unit. The event is free, but offerings will be accepted at the event. Attire will be duty uniform or civilian equivalent. The purpose of the NPB is to emphasize the importance of prayer for the Nation, Fort Jackson, our armed forces, and our Families. The themes for the breakfast are: prayers for the nation, community relationship and spiritual fitness. This tip came from fellow Patheos blogger Hemant Mehta (who got it from Chris Rodda). There still is no time table for the implementation of the Policy Lab or any new approach. The statement is light on specifics. When I ask about when and how this is going to happen, I have gotten no responses. I hope to have another post later today with reactions to the Asst. Secretary’s remarks and am holding out hope that SAMHSA might address the issues of timing and implementation. In one form or another, the question on the minds of many mental health researchers and advocates is “what now?” After I received the statement above on 1/8, I asked a SAMHSA spokesman when researchers would be able to submit programs or update new programs. There has been no answer. It appears that SAMHSA discontinued NREPP even though the agency is not prepared to “reconfigure its approach” to evidence-based practice. Thus far, something is being replaced by nothing. Also out this morning, the Washington Post covers much of the same ground but provides no details from SAMHSA about when the new process will begin. I say again, SAMHSA replaced something with nothing and did so in the middle of an addiction epidemic. Again, thank you for the NREPP. I feel that the registry and its website are crucial public health tools. Respectfully, I wish to know how you will grow the NREPP and its website, how you intend to review more opioid abuse-specific programs, and how I may be of help to you in these endeavors. These are good questions. I would add, why did SAMHSA terminate NREPP when it appears that SAMHSA doesn’t have another evidence-based process ready to go? For background, see my first post on the termination of NREPP. SAMHSA and HHS are committed to advancing the use of science, in the form of data and evidence-based policies, programs and practices, to improve the lives of Americans living with substance use disorders and mental illness and of their families. People throughout the United States are dying every day from substance use disorders and from serious mental illnesses. The situation regarding opioid addiction and serious mental illness is urgent, and we must attend to the needs of the American people. SAMHSA remains committed to promoting effective treatment options for the people we serve, because we know people can recover when they receive appropriate services. SAMHSA has used the National Registry of Evidence Programs and Practices (NREPP) since 1997. For the majority of its existence, NREPP vetted practices and programs submitted by outside developers – resulting in a skewed presentation of evidence-based interventions, which did not address the spectrum of needs of those living with serious mental illness and substance use disorders. These needs include screening, evaluation, diagnosis, treatment, psychotherapies, psychosocial supports and recovery services in the community. The program as currently configured often produces few to no results, when such common search terms as “medication-assisted treatment” or illnesses such as ”schizophrenia” are entered. There is a complete lack of a linkage between all of the EBPs that are necessary to provide effective care and treatment to those living with mental and substance use disorders, as well. If someone with limited knowledge about various mental and substance use disorders were to go to the NREPP website, they could come away thinking that there are virtually no EBPs for opioid use disorder and other major mental disorders – which is completely untrue. They would have to try to discern which of the listed practices might be useful, but could not rely on the grading for the listed interventions; neither would there be any way for them to know which interventions were more effective than others. 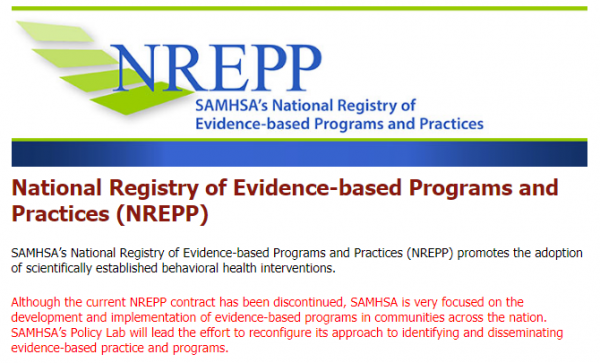 We at SAMHSA should not be encouraging providers to use NREPP to obtain EBPs, given the flawed nature of this system. From my limited review – I have not looked at every listed program or practice – I see EBPs that are entirely irrelevant to some disorders, “evidence” based on review of as few as a single publication that might be quite old and, too often, evidence review from someone’s dissertation. This is a poor approach to the determination of EBPs. As I mentioned, NREPP has mainly reviewed submissions from “developers” in the field. By definition, these are not EBPs because they are limited to the work of a single person or group. This is a biased, self-selected series of interventions further hampered by a poor search-term system. Americans living with these serious illnesses deserve better, and SAMHSA can now provide that necessary guidance to communities. We are now moving to EBP implementation efforts through targeted technical assistance and training that makes use of local and national experts and will that assist programs with actually implementing services that will be essential to getting Americans living with these disorders the care and treatment and recovery services that they need. These services are designed to provide EBPs appropriate to the communities seeking assistance, and the services will cover the spectrum of individual and community needs including prevention interventions, treatment and community recovery services. We must do this now. We must not waste time continuing a program that has had since 1997 to show its effectiveness. But yet we know that the majority of behavioral health programs still do not use EBPs: one indicator being the lack of medication-assisted treatment, the accepted, life-saving standard of care for opioid use disorder, in specialty substance use disorder programs nationwide. SAMHSA will use its technical assistance and training resources, its expert resources, the resources of our sister agencies at the Department of Health and Human Services, and national stakeholders who are consulted for EBPs to inform American communities and to get Americans living with these disorders the resources that they deserve. Although the current NREPP contract has been discontinued, SAMHSA is very focused on the development and implementation of evidence-based programs in communities across the nation. SAMHSA’s Policy Lab will lead the effort to reconfigure its approach to identifying and disseminating evidence-based practice and programs. The Policy Lab is referred to on SAMHSA’s website and is led by Christopher Jones. The Policy Lab was created by the 21st Century Cures Act and is an evolution of SAMHSA’s Office of Policy, Planning and Innovation. Clearly, the issue with the change from NREPP isn’t with the term “evidence-based” since the above statement uses the term and the Cures Act requires evidence-based interventions. For the exact language of the Cures statute, scroll to the end of this post. Yesterday (Jan 4, 2018), a contractor for the Substance Abuse and Mental Health Services Administration alerted program participants that funding for work on the National Registry of Evidence-Based Programs & Practices had been terminated “for the convenience of the government.” According to a source with the contractor, the work was not terminated due to any problems with their work but because the administration did not want to continue it. According to my source, this action follows a freeze in the work which had been in effect since September, 2017. The NREPP is an effort to alert the public and professional community about evidence-based practices in mental health treatment and prevention. According to SAMHSA’s 2018 budget justification, NREPP helps meet the requirements of the 21st Century Cures Act which requires the government to provide accurate information about what works in the treatment of mental illness and drug/alcohol addiction. SAMHSA is responsible to post this information on an agency website. 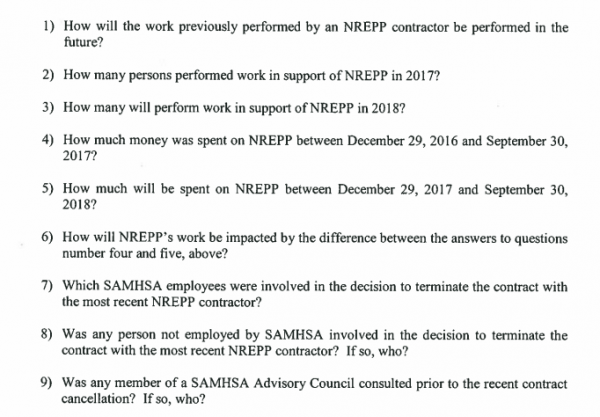 SAMHSA requested $2.8-million in FY 2018 for NREPP. According to an email I obtained which was later posted on Twitter by someone else, Development Services Group alerted their constituents that their contract to manage the NREPP’s contents and website had been terminated on December 28, 2017. It is with great regret that we write to inform you that on December 28, 2017, we received notification from SAMHSA that the NREPP contract is being terminated for the convenience of the government. This cancellation means that we can no longer make any updates to your program profile. We thank you for the help and cooperation you gave so that we could complete your review. We are deeply saddened by the government’s sudden decision to end the NREPP contract, under which we have been able to provide and strengthen science-based information about mental health and substance use treatment and prevention programs, both nationally and internationally. According to DSG, it isn’t clear what will become of NREPP. The reason the process of evaluating programs was given to a contractor was because SAMHSA did not have a sufficient number of staff to do the job. The website may remain but at present no additional guidance has come from SAMHSA. According to DSG, all materials are being returned to the government and not sent to another contractor. My calls and emails to SAMHSA have not been returned. It isn’t clear how SAMHSA will meet the mandates of the Cures Act without a functioning evidence-based program. Another open question is why the program was halted in the middle of the fiscal year without cause (“for the convenience of the government”). The entire text of the 21st Century Cures Act is here. For the section relevant to the Policy Laboratory and the work on evidence based practices and programs, see below. SEC. 7001. ENCOURAGING INNOVATION AND EVIDENCE-BASED PROGRAMS. Laboratory (referred to in this section as the `Laboratory'). appropriate by the Assistant Secretary. begin implementation of this section not later than January 1, 2018.